I’m so delighted to share today’s conversation with three women representing two generations of the Auville Family. Between them, they own two floral businesses. Mom Chris Auville and daughter Jessica Hall operate Harmony Harvest Farm with their spouses (Chris’s husband and Jessica’s dad Martin Auville and Jessica’s husband Brian Hall). 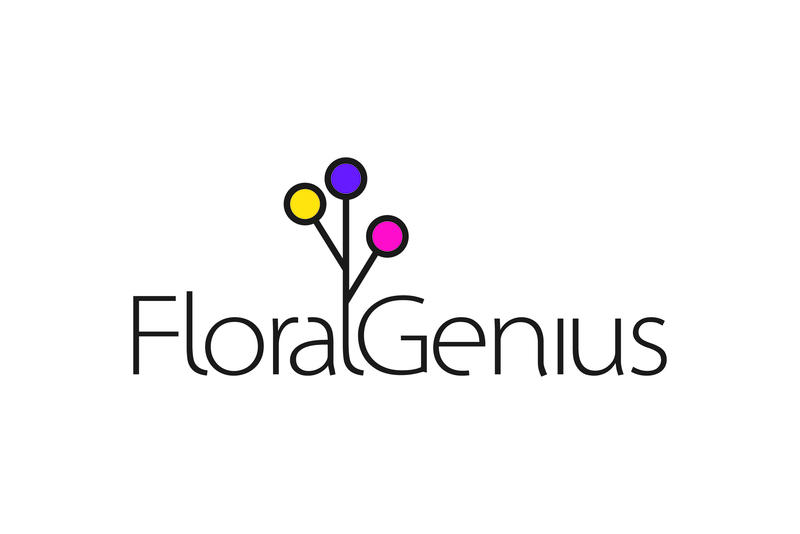 And as you will hear in part two of this episode, Jessica and her sister Stephanie Auville have just launched Floral Genius, the reincarnation of a product line previously owned and marketed by Dorothy Biddle Service. With a deep desire to set roots in a farm setting within the Shenandoah Valley of Virginia, Brian and Jessica, coupled with her parents, Martin and Chris Auville, created the vision for Harmony Harvest Cut Flower Farm. 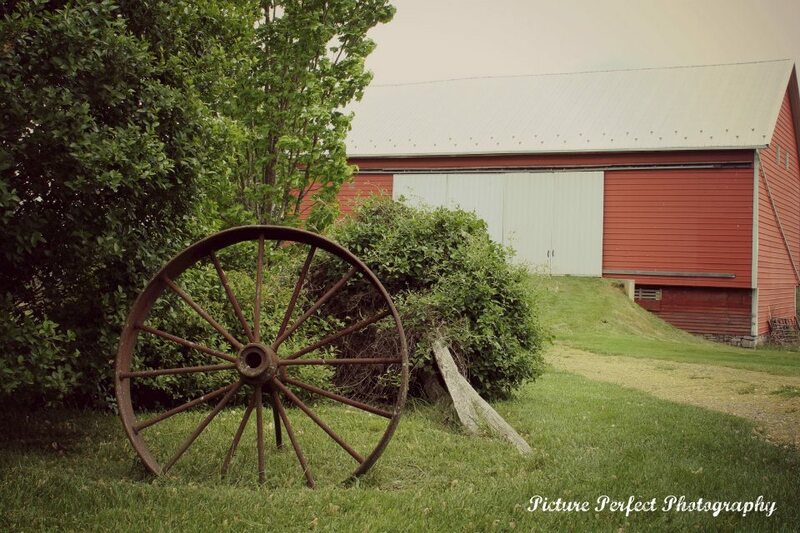 In 2011 they purchased a historic 1890 farmhouse with a bank barn on 20 acres of fertile rolling fields. Only a few miles down the road from Jessica’s parents, it was the perfect homestead for Jessica and Brian to begin living out their dream. At that point, the work really began as each played an impressive role in designing water systems, building walk-in coolers, studio buildings, new entrance roads and greenhouses. Over the past few years, not only has Harmony Harvest’s business and fields grown and expanded, but so has the Hall family. When Jessica and Brian embarked on their cut flower farming journey, they had one child Adelaide Catherine. Now, the picture is much different. Adelaide became a big sister to firecracker Marion, and most recently twin brothers, Lincoln and Levon arrived. 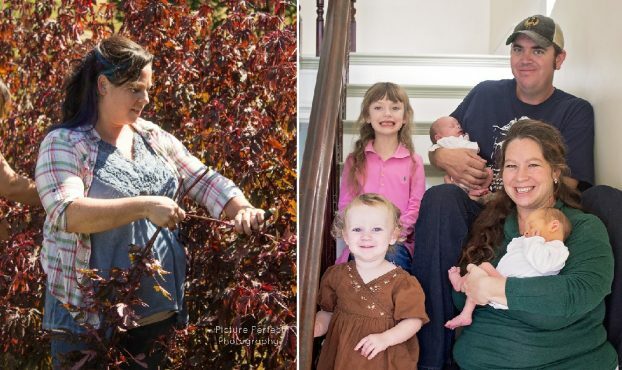 While the business has flourished, so has their family of 6! Ranunculus inside one of the farm’s growing structures. 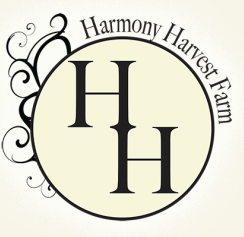 Harmony Harvest currently grows intensively on 3 acres and operates 3 growing houses, with plans to expand that in the coming season. With over 200 different botanical offerings, the farm’s decadent selections, not to mention its heart and soul, are poured into each bloom grown and marketed. 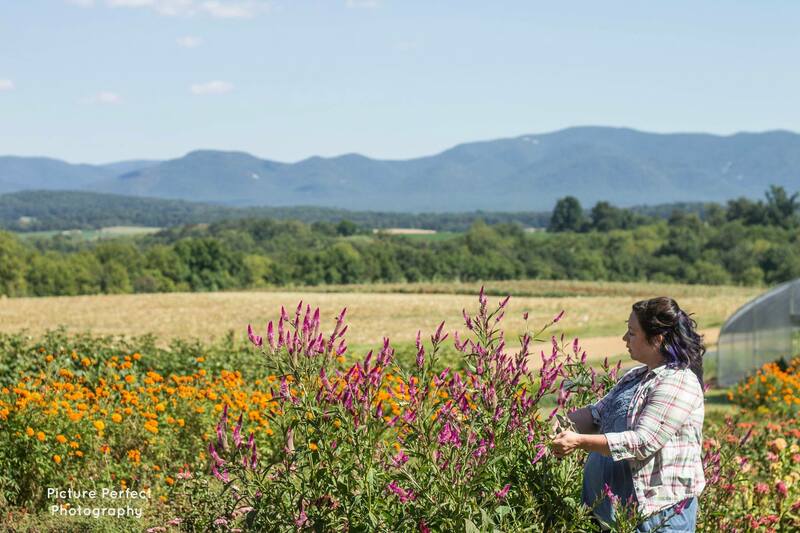 With an eye for floral design, Jessica’s ability to arrange the bounty of the fields was a natural complement to the farming side of their business right from the start. She has always had an artistic flair and dabbled in many creative mediums before finding her passion with the most fragile of paints — flowers. Having spent her teenage years working in a flower shop and taking design classes, she admits to never imagining having a floral profession until the farm came along. Jessica Hall (left) and Jessica and Brian with their family of four. As Lead Designer and Master Grower, Jessica is passionate about her client’s personal story. A vibrant and creative soul, she dabbles in all things magical. She grew up in an agriculturally rich family, where tending to and growing a garden were everyday tasks and nurturing nature was instilled at an early age. 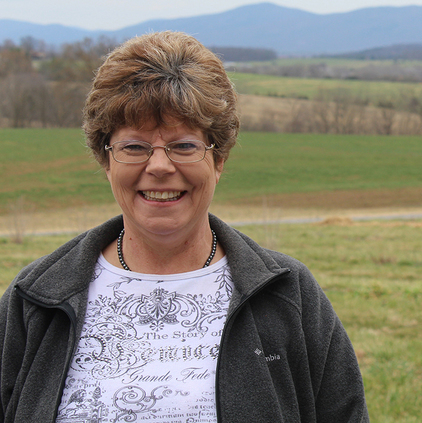 She pursued her love of growing and designing by majoring in horticulture at Virginia Tech. Jessica and Brian met there and together they decided to forge a path and build their own business and work in a family setting. Today, Jessica runs the day-to-day operations on the farm, leads all the floral design projects, and is the mother of four children. In just a few short years, they have quadrupled their growing space, added lots of new botanical selections to their floral availability list, and created a humming, growing rhythm for their farm and family. Chris Auville. Don’tcha love how she and Jessica have such similar smiles? Chris Auville, Chief Flower Officer, is the business manager for Harmony Harvest Farm. If you have ever communicated with Harmony Harvest, be it by email, phone, or in person, Chris has most likely greeted you. 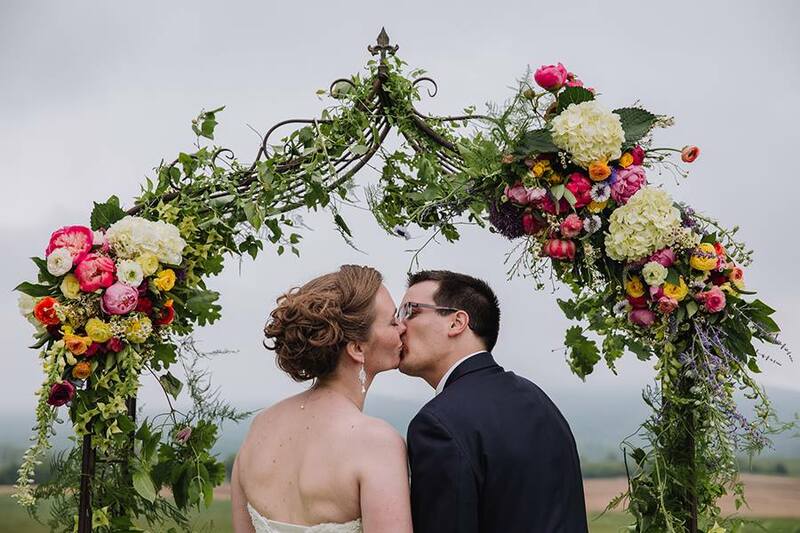 Chris corresponds with clients, schedules appointments, produces quotes, and coordinates floral aspects for wedding days and other events. With a MBA and over 30 years of business experience, Chris is a perfect fit for the farm’s sales and business operations. From working with brides to creating grocery store contracts, Chris gets it done. Also serving as Mom to Jessica a Nana to her grandchildren, Chris plays an important role as they all work together under the family business umbrella. As a mother–daughter duo, Chris and Jessica are grateful to work together and complement each other with their backgrounds and experiences. In part two of this podcast, you’ll hear from Stephanie Auville, Jessica’s sister, who joins us on the line. The two wanted to honor their late grandmother’s legacy and they wanted to make her proud. A few weeks later a door opened on their future and they decided to walk through it. 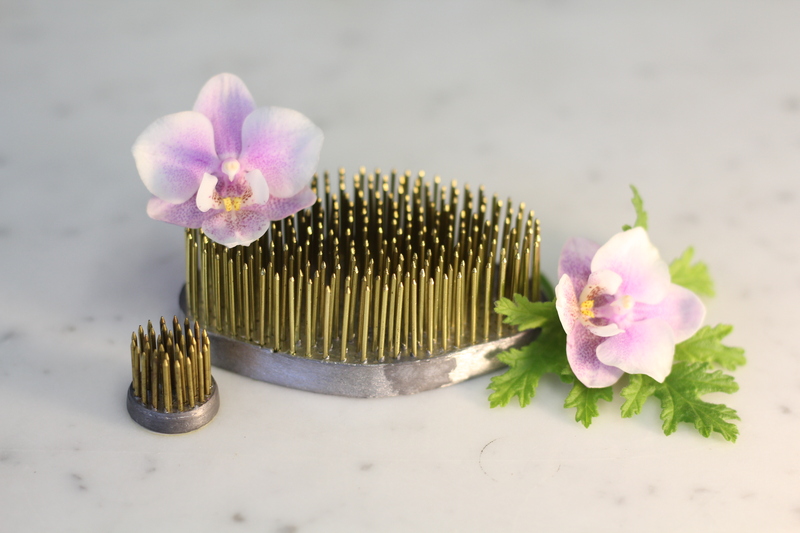 Jessica and Stephanie purchased the manufacturing rights and all equipment to mold, make, package, and sell all styles of metal pin frogs. 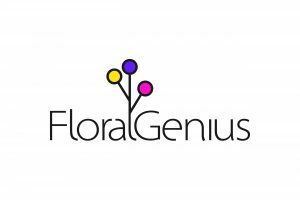 They’ve named the new manufacturing enterprise Floral Genius. As we discuss, the floral frog production has been part of the Dorothy Biddle Company for many years. Reintroduced as Floral Genius, Jessica and Stephanie are honored to take over the reins and continue to bring quality and innovative tools to the market for all designers. 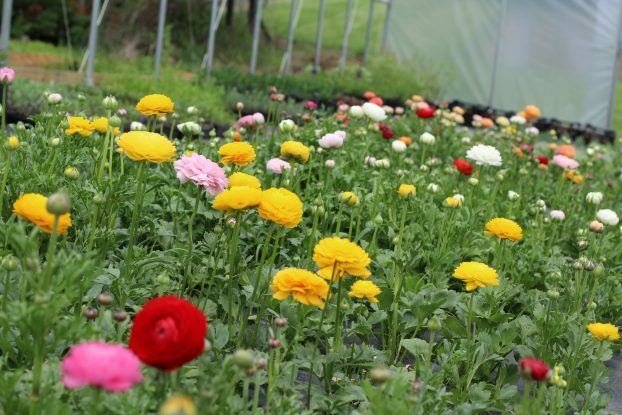 Naturally, there are some great synergies between Harmony Harvest Farm and Floral Genius, although they will operate as separate businesses, both housed at Harmony Harvest Farm. The next few months will entail moving large machines, learning production and building a website. 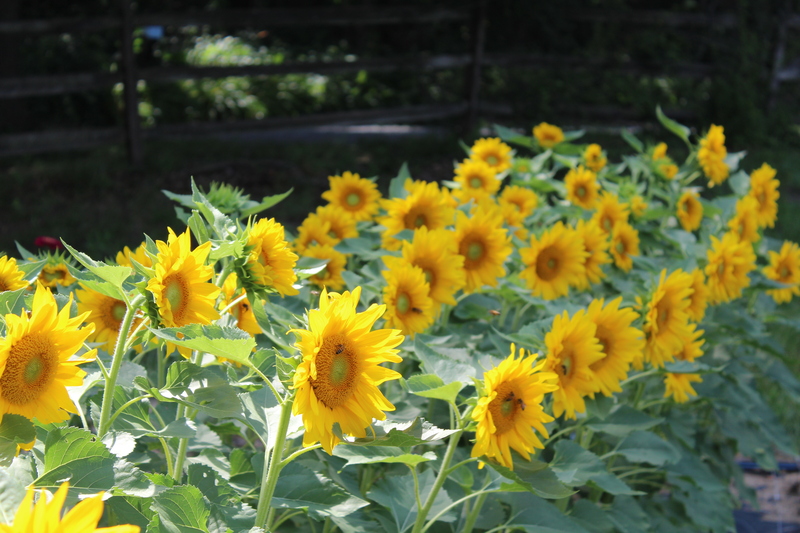 Find Harmony Harvest Farm and Floral Genius at these social places. Thanks so much for joining me today. The Slow Flowers Podcast has been downloaded more than 155,000 times by listeners like you. THANK YOU to each one of you for downloading, listening, commenting and sharing. It means so much. If you value the content you receive each week, I invite you to show your thanks and support the Slow Flowers Podcast with a donation — the button can be found on our home page in the right column. Your contributions will help make it possible to transcribe future episodes of the Podcast. 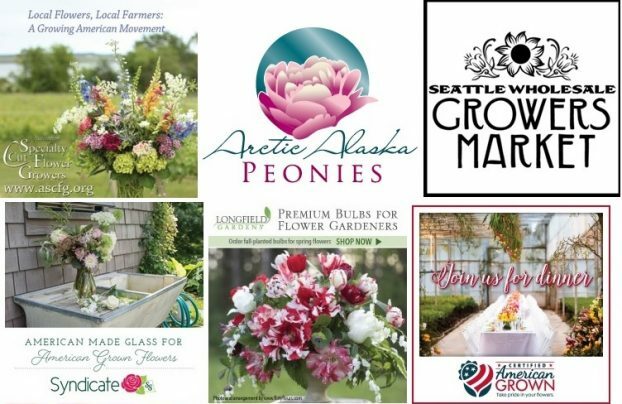 Thank you to our lead sponsor for 2017: Certified American Grown Flowers. The Certified American-Grown program and label provide a guarantee for designers and consumers on the source of their flowers. Take pride in your flowers and buy with confidence, ask for Certified American Grown Flowers. To learn more visit americangrownflowers.org. Longfield Gardens has returned as a 2017 sponsor, and we couldn’t be happier to share their resources with you. Longfield Gardens provides home gardeners with high quality flower bulbs and perennials. Their online store offers plants for every region and every season, from tulips and daffodils to dahlias, caladiums and amaryllis. Visit them at lfgardens.com. More sponsor thanks goes to Syndicate Sales, an American manufacturer of vases and accessories for the professional florist. Look for the American Flag Icon to find Syndicate’s USA-made products and join the Syndicate Stars loyalty program at syndicatesales.com. I’m Debra Prinzing, host and producer of the Slow Flowers Podcast. Next week, you’re invited to join me in putting more American grown flowers on the table, one vase at a time. And If you like what you hear, please consider logging onto Itunes and posting a listener review. The content and opinions expressed here are either mine alone or those of my guests alone, independent of any podcast sponsor or other person, company or organization. The Slow Flowers Podcast is engineered and edited by Andrew Brenlan. Learn more about his work at shellandtree.com. This entry was posted on Wednesday, February 8th, 2017 at 9:47 am	and is filed under American Grown, Blog Posts, Creativity, floral design, Flower Farming, Podcast Episodes, SLOW FLOWERS Podcast, Slowflowers.com the Directory of American Flowers. You can follow any responses to this entry through the RSS 2.0 feed. You can leave a response, or trackback from your own site. Hello Debra, you have shared such a great post with us. I like your tips for the garden. It will help me for making a wonderful garden. Thanks for sharing.